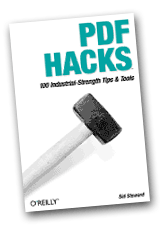 You can use our command-line PDFtk Server to export and import PDF bookmark data. PDFtk Server comes with our Windows application PDFtk Free. We also offer PDFtk Server installers for Mac, Red Hat and CentOS. Many Linux distributions offer a pdftk package you can install. For more examples of generating bookmark data and then importing it into a PDF, check out our article: Enjoy Photos on Nook or Kindle Using PDF Albums.